BUFFALO, N.Y. — Need to kill tumors? Just add heat. That's the promise of heated magnetic nanoparticles, a futuristic-sounding technology that could one day be used to fry and eradicate cancer cells without harming healthy tissue elsewhere in the body. New research led by the University at Buffalo advances this concept, with scientists developing nanoparticles that can zap tumors with significant amounts of heat under a low magnetic field. The study was published online on June 21 in the journal Small, and was selected as a future cover article. "The main accomplishment of our work is the greatly enhanced heating performance of nanoparticles under low-field conditions suitable for clinical applications. The best heating power we obtained is close to the theoretical limit, greatly surpassing some of the best-performing particles that other research teams have produced," says Hao Zeng, PhD, professor of physics in the UB College of Arts and Sciences, who led the project. He explains that the therapy has a number of potential benefits over other treatment routes. It's minimally invasive, and is not expected to generate the type of severe side effects often associated with chemotherapy and radiation, he says. "The treatment will only heat up the region where nanoparticles are without affecting healthy tissues that are further away, so we anticipate few side effects," Zeng says. "In addition, the magnetic field that's used to excite the particles can penetrate deep into the body from an instrument that does not require any contact or insertion of probes. As such, the therapy can reach parts of the body that are not easily accessible to surgery." The study was a collaboration between UB; Capital Normal University in Beijing, China; the Chinese PLA General Hospital in Beijing; and the University of Nebraska-Omaha. Shuli He, PhD, a visiting scholar at UB from Capital Normal University, was first author. A lot more research needs to be done before the nanoparticles are available to patients. But here's how the therapy would work: First, doctors would use targeting technologies to direct nanoparticles to tumors in patients' bodies. Then, exposure to an alternating magnetic field would prompt the particles' magnetic orientation to flip back and forth hundreds of thousands of times per second. This process would cause the particles to warm up as they absorbed energy from the electromagnetic field and converted it into thermal energy in the targeted regions. This form of cancer treatment is known as magnetic nanoparticle hyperthermia, and it's not new. But Zeng and colleagues designed new magnetic nanoparticles that get hotter and generate heat a few times faster than some of the highest-performing magnetic nanoparticles studied under low-field conditions, he says. "Within the body, heat energy is continuously carried away — for example, by blood flow — making it difficult to reach the required temperature to kill cancer cells," Zeng says. "One needs particles with the highest heating power possible. Our particles have demonstrated impressive heating power even at low magnetic field amplitude and frequency deemed safe for human body." The team crafted two types of nanoparticles, each consisting of metal alloys chosen for their ability to generate heat under a magnetic field. 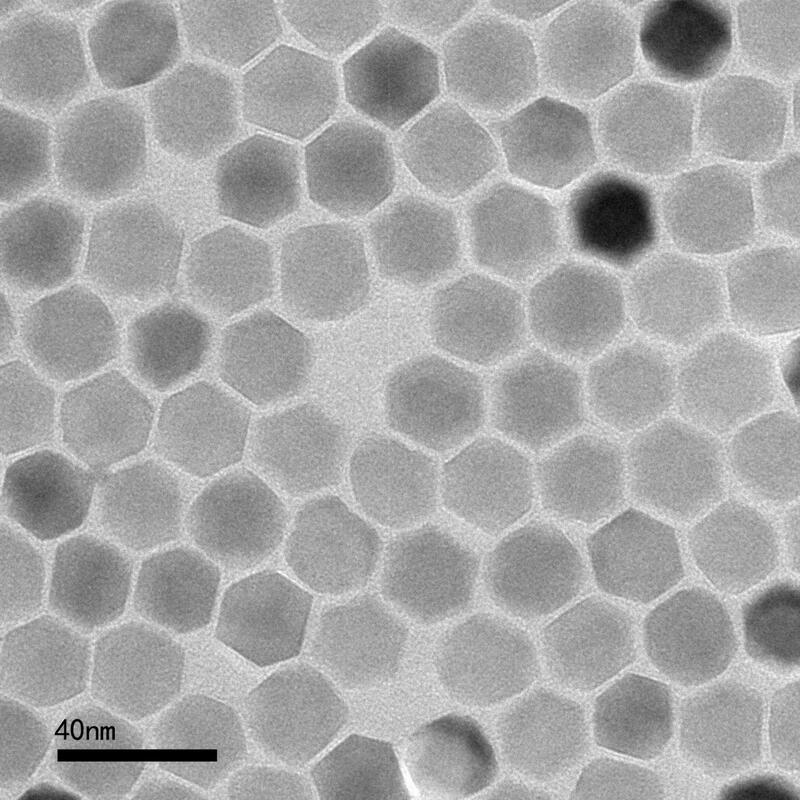 One of the new nanoparticles contains manganese cobalt ferrite, while the other is made from zinc ferrite. The manganese-cobalt-ferrite particles reached maximum heating power under high magnetic fields. But the biocompatible zinc ferrite particles heated up with impressive efficiency under an ultra-low field. "The bottom line is our zinc ferrite particles are designed for low fields suitable for clinical applications," Zeng says. "For other particles reported in the literature, the field used is typically higher. Most of these other particles are not capable of heating at our chosen field parameters." As he explains, "Typically, after a surgery to remove bone tumors, a synthetic material called bone cement is injected to fill the voids. If we introduce our nanoparticles into the bone cement, they can be heated on demand to kill any tumor cells that remain nearby, and help prevent recurrence of the cancer." To simulate this scenario, Zeng and colleagues embedded their zinc ferrite nanoparticles into bone cement and used it to heat up a pork rib. With just a small number of nanoparticles (1 percent of the bone cement, by weight), the experimental set-up reached a temperature high enough to kill tumor cells.